So why is it that every time I hear the German National anthem played; be it at the World Cup Football matches or when Master ‘Zebb takes to the Top step of the podium... I immediately expect it to be followed by the Italian National anthem, eh? Something to do with hearing it played ‘Juan too many times for DER TERMINATOR; Ja-Ja! "What a race. We would like to have clarification about the safety car situation as the red light on the exit from my first pit stop destroyed a race which otherwise would have offered us very good possibilities. Our point of view is that as the safety car had passed the pits without having the cars lined up behind it, there should not have been a red light. There was a green light for a moment and then suddenly it went red again. We believe that this was not correct. Our strategy was right in that context as we took the opportunity which could have given us a finish even close to the podium." As I found it even more ironic how immediately after the race, the only F1 Constructor whose Team Quotes were missing were Scuderia Ferrari’s... As they seemed to have been hit hard by the Stewards mistakes in Spain! And I’m NOT sayin’ there’s any connection here... 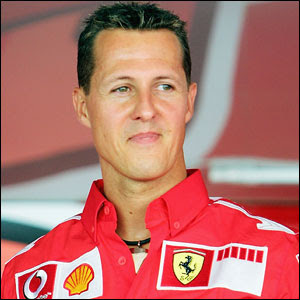 Yet isn’t it funny how Michael’s ‘Ol Cronies keep showing up as the ex-Driver guest Stewards... As first it was his pal Damon Hill and then in Valencia it was “Heinz 57,” a.k.a. Heinz-Harald Frentzen... Who as the cheeky Will Buxton was quick to remind us of, Michael nipped Corina, his wife when she was Frentzen’s girlfriend! And as Clyde just pointed out to Mwah; perhaps they got some Officials from the World Cup Referee’s crew, eh?